The tables present SSI data by eligibility category (aged, blind, and disabled) and age. State data on the number of recipients and amount of payments are shown in Tables 1 and 2, respectively. SSI recipients who also receive Social Security (Old-Age, Survivors, and Disability Insurance) benefits are shown in Table 1 and also in Table 3, which presents data at the county level. 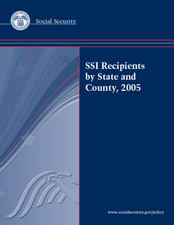 Stella M. Coleman in the Division of SSI Statistics and Analysis programmed and compiled the data for this report. Staff of the Division of Information Resources edited the report and prepared the print and Web versions for publication. Not all cell suppression is due to numbers being smaller than a threshold value. To prevent derivation of suppressed table cells by subtracting from totals, additional cells may be suppressed regardless of their value.